Couple of days ago in HeXentic Games team we announced the development of a new project, and it was The Holders “Seeker’s Trial”. The game is obviously focused in the story of the creepypasta series “The Holders”. It makes an story about a seeker who face the terrible world after the reunion of the objects. The game is a First Person Exploration game, and me as Level Designer, I’m doing my best to achieve the complete potential of the story in the scene, The ambient is very cryptic and also with a lot of horror style. I’m developing it in CryEngine. 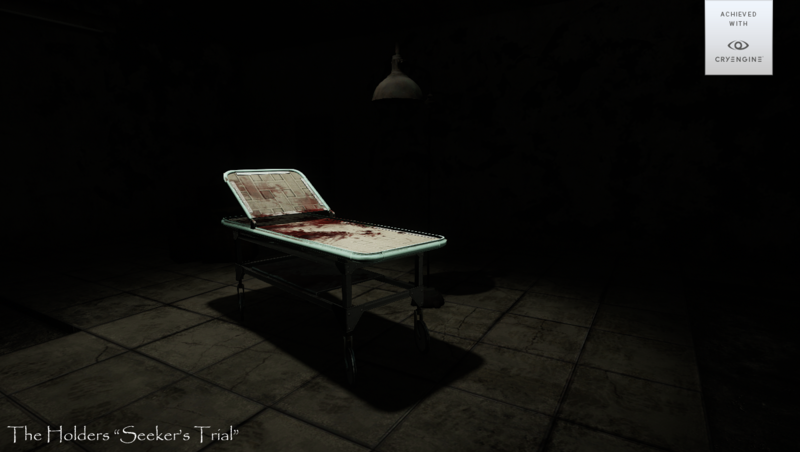 I know couple of months ago I made a Hospital using The Holders as a story to base the map using Unreal Engine 4, in fact that was the first attempt to create a game based in The Holders saga, anyway I realize the final result was very positive but unfortunately to me I wasn’t able to achieve what I was looking for, but instead of make another scene in Unreal Engine 4, I decide to obey a little instinct about to come back to CryEngine, now with a subscription system know as “Engine as a Service”(EaaS). Anyway I decided to take the risk and don’t try using my FreeSDK version of CryEngine and I jumped directly in the EaaS version of CryEngine. I realized in first instance the engine have improved a lot of new features, but I didn’t waste my time and I started to first of all bring my assets of Unreal Engine to CryEngine, I used 3ds Max + Photoshop and fortunately in 3 days I was able to bring all the assets that I bought in Unreal Engine marketplace to CryEngine with collisions and with its materials. Anyway I started with the map, The process took me around 4 days to complete the whole structure of the map using some props and lightning. Why I’m telling all this? well to be honest I feel really proud of the current results of the environment, I learned a lot, even I made some texture performance to achieve a more realistic feeling in the environment.